Have you just finished writing a historical discourse about your company and want to publish your work as a book? If so, this post is especially for you. 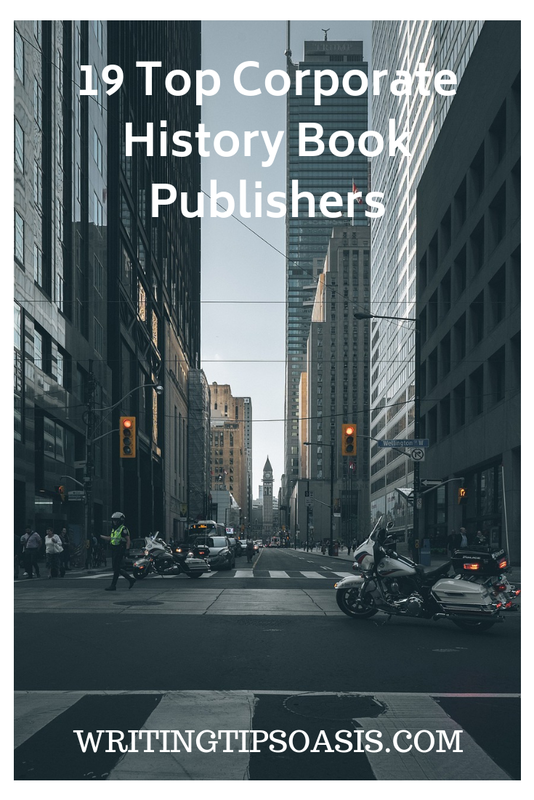 Take a look at the following 19 top corporate history book publishers. It is important to have a publisher who cares about your company’s history as much as you do. Fenwick Publishing was founded in 1993 to print, promote and share the history and background of companies, firms and agencies. Their team of writers, creators, designers and photographers work tirelessly to capture the essence of your organization. They have worked with names such Pfizer, Ford Motor Company, Kohler, NASCAR, Discovery Channel, New York Giants and Hines. Working with such clients has given them the necessary insight and knowledge required to work with companies and brands. Quality content, impeccable editing and designing are things you can expect from the Washington based publisher. Contact them using an online form. A reputed publisher of corporate history books and family business history since 2002. Originally a part of Greenwich Publishing, it became an independent entity in 2002 and became known quickly for its steady commitment and focus on quality. A corporate history book is your way of letting the shareholders and your partners know what the brand is, its values, mission and story. Everything you are and have been is printed for generations to come. As the book is an everlasting medium, the pictures and content is classic without going overboard or compensating on quality. Essex uses stellar storytelling capabilities, intricate design skills and exceptional photography skills to build an unforgettable tale. Located in Missouri, you can contact them via email. Your company is your blood, sweat and tears. You need an expert team of professionals to share the story of how you made it to the top. Formed in 1987, Greenwich promises you excellence in corporate history and business books. Their dedicated employees ensure you have a well-designed, edited, proof read and marketed book. A corporate history book needs to be well researched, coordinated and printed to give the readers an insight into the brand. From individuals to families to businesses, they have worked with everybody. Some of the brands they have worked with include Coors, Airstream, Kimberly Clark and Greenwich Hospital. You can contact the publisher situated in California via email. Since 1975, Documentary Media has been printing and publishing books with excellent stories and photos. Their vivid photography, smart editing and content arrangement made their books a pleasure to peruse. Started as Scribe Publishers, they became Documentary Media in 1981. The books have a spirit and not just some monotonous recital of the brand’s fact and numbers. A consumer or client can know the brand and company better through the book. Restaurants, institutions, museums, real estate companies and retail companies have worked with them to narrate their history and future plans for expansion. The Seattle based publisher can be reached via email. Marian Calabro is a writer, author, editor and historian. She understands the value of heritage, legacy and history. For institutions, brands, agencies and companies, their history is worth celebrating and narrating. So Marian launched Corporate History.net in 2004 to write and narrate the magic and mystery about popular companies and their teams. Unlike other corporate publishers, this firm delves into all aspects and departments by painting the entire picture of the company. Factual research, data, stories, interviews and information is collected painstakingly by Marian’s team for their clients. You can contact them by using an online form or via email. Corporate history books can be bland and boring. Publishers just use the data offered to them by the companies and don’t spend any time of their own doing accurate research or in-depth interviews. Jeff Rodengen wanted to change this situation. As a writer, he wants to tell the world about the businessmen, the owners and the employers. The way they overcame hurdles and achieved their goals. A well written corporate history book can inspire people in need of motivation. They have a unique formula for photography, coffee table books and corporate history books that have won awards and accolades. You can reach out to the Fort Lauderdale based publisher using their contact form. One of the most successful publishers in Australia, Big Sky Publishing prints several genres. Focusing on non-fiction genres, they work with expert writers and professionals who have complete knowledge of the subjects they write on. History, self-help, autobiography, health, lifestyle, environment and corporate history are some of the topics they print. With the evolving media dynamics, they don’t just print books but offer digital media, films, branded content, coffee table books, e-books and magazines. You can contact them for corporate publishing via email. Formed in 1973 in UK, Colin Walsh and Tony Littlechild started Book Production Consultants to provide complete publishing and creative solutions to companies and individuals. With the founder’s experience in publishing, it was easy for the company to offer personalized, attentive and unique services to their clients from editing to designing to marketing. The entire burden of figuring the book is on them and all you have to do is just give them the necessary information. Fill the contact form to learn more information or request details. A volume about the publisher’s hometown made them realize there is a whole niche of people, companies and brands eager to share their stories. A pictorial representation or coffee table books are just some methods they could use to convey the rich history and heritage of legends, institutions and universities. Their insistence on quality and graphic design has made them a name to reckon with in the industry. With over 2000 books published by them they have worked with every industry and type of organization possible. Contact them using the online form to learn more about the types of projects they handle. Greystone Books is a trade book publisher in Canada. Printing only non-fiction, they are also an eco-friendly publisher. Nature, health, environment, adventure and corporate history publishing. They have a special team doing custom publishing for professionals, companies, institutions and organizations. An effectively designed and written book can market your brand in excellent ways and reach previously untapped markets. Email them to learn more about their prices and processes. This remarkable publishing house has a Business imprint titled Agate B2. Under this imprint they print stories about successes, failures, goals, motivation, business, personalities, organizations and brands for the general public. Their client list speaks for themselves as they have interviewed several CEOs, business leaders and geniuses in their specific fields. Proprietary titles with institutions and agencies are also a specialty of theirs. Email them for further details and information. From business tactics, action plans, success stories to corporate history, Berrett-Kohler does it all. Helmed by Steve Piersanti, an experienced and driven publishing professional, it is the go-to publisher for anyone interested in knowing about management, communication, leadership and success. Just sharing the history of a brand isn’t enough, readers want to know how it managed to surpass expectations and achieve their targets. With Berrett-Kohler, they know that it is a social and corporate responsibility to allow consumers, clients and readers behind the scenes and learn what goes into building a good brand. Find out more by reading their guidelines and contact details. Located in Washington, Braddock Communications has been a publisher since 1974. A small and dedicated team of experts work tirelessly to print books about small businesses, education and government. Corporations can sponsor publications or hire them to provide marketing communication material that essays the essence of their brand. These books can be used as a way to share their past and future of the brand, agency or organization. Email them to know more about the company and services they offer. The CEO of a top ranking company doesn’t have time to write his own story. The brand that is recognized globally by its logo needs no advertising yet it’s good to remind clients, consumers and the industry of its relevance. Brown Books in Texas will guide you from the first step of book writing to the final step, the marketing and promotional possibilities. The book becomes an unconventional way to promote your story and brand. Write to the Texas based publisher to learn more about them. Touted to be the leading bespoke and custom publisher in the United Kingdom, Third Millennium Publishing knows how to make memorable books. You let them be in the driver’s seat as they do all the hard work of collecting information, data, stories, facts and statistics. This information gets combined with high quality pictures and engaging content. Smart layouts, beautifully designed books and hard hitting facts come together to build a story about your company or organization. Language is no barrier as Third Millennium has published books in Dutch, French, Italian, Arabic and Chinese. Their books are excellent for remembrance or gifting or just celebrating a milestone of your brand, personality or professional institution. Contact them via email to discuss publishing a book. A lot of corporate history book publishers don’t value the suggestions offered by businesses. They collate data and sift through it without ever getting into the nitty gritty with the owner and the brains behind the operation. Koehler Books offers a personalized touch and collaborates with brands, agencies and institutions instead of just doing grunt work. That quality shines through the books and consumers become more attached to the brand. Koehler promises to get you the results you want using out of the box methods and ideas. You can submit your work or suggestions to them using this online submission form. Established in 2003 by Dr Ulrich Frisse, they are based in Canada. As an international corporate lawyer, Frisse understood the value of the history and stories behind corporations, businesses and entrepreneurs. HBS has worked with the premium brands and companies in Canada eager to tell their story to their clients and consumers. Their pride, their mistakes and their future plans are all laid out wonderfully so the reader can absorb everything. They can be the motivational push people need when they are stuck or in need of someone to look up to. He formed a team of historians, writers, designers, editors and marketers who specialized in creating corporate history books, anniversary editions, legacy books and marketing stories. Use the contact form to send them or a message or email them. A corporate history book can be an anniversary book, a milestone or a useful way to preserve your legacy. No dull recitation of facts or data for you but an intriguing tale and insightful photographs that take you on an intimate journey. This creates a bond between the reader and your brand, a bond that deepens as you share your real, raw story with them. Situated in Georgia, the company has been around since 1989 and ventured into children’s books, biographies and picture books. The focus largely remains on corporate history books, commemorative books and anniversary books. Schools, art institutes, corporations, museums, schools and associations are some businesses they have previously worked with. Contact them using their online form. You need a historian to appreciate the history of your team, organization or company. Experienced, professional historians work at History Associates and go through your entire history with a fine toothed comb. Their niche in corporate history means they will be able to recollect and narrate your story, your identity without compromising on facts and ideals. Archivists and collection managers are also attached to their team who understand what to look for. Inexperienced publishers can waste a company’s time by asking questions that don’t really matter in the larger scheme. Their experience extends to arranging exhibitions and handling the concept to design stage of your book. It can be a book, web display, digital exhibit or booklet depending on your choice and need. Use the online form to contact the Maryland based company. Do you know any other corporate history book publishers? Tell us about them in the comments box below!